The text below is a talk given by the author at the 2nd Jacques Rueff Conference of the Centre d’Etudes Prospectives pour Monaco (CEPROM) and the European Center of Austrian Economics Foundation (ECAEF) in Monaco on 23rd November 2017. I will try to present evidence that it is not disadvantageous for humans to live in a small state today. On the contrary, I will describe why – in the current stage of human history and development – it has even become advantageous to be inside a small political entity. Assuming my thoughts are correct, territorial extension does not play the critical role for the wealth of a nation that it used to in the past. More than ever, the safety, wealth and pursuit of happiness of a state’s people depend on the fragile balance of two main factors: 1. on statecraft in terms of a well-balanced cooperation between politics, citizens and administration; 2. on an institutionally secured, universal right to free private communication and cooperation (with one another inside the state as well as with all humankind outside). Only an intellectually flexible, economically adaptive, well-educated and homogenously committed community will have the tools necessary to persist in a world full of unseen challenges and paradox requirements. In this sense, the call for unlimited thinking is not only a question of practicability but rather also a matter of wise political leadership, particularly when standing on the grounds of a limited space. For a long time in human history, guaranteeing prosperous and wealthy living conditions for its citizens was the privilege of states ruling over extensive areas and widespread means of production. Armed forces were able to live off a land as long as farmers knew how to cultivate their spacious fields effectively. Protected by military means outwardly, and by law inside, bright engineers and entrepreneurs were able to successfully advance their technologies. At least this is what the vast majority of people used to think and what many still hold to be true. Thus, human history brings forth again the paradoxical correlation of simultaneously opposing trends: The progress of technology on the one side is accompanied by an individual intellectual regression on the other. While humankind as a whole is moving forward in the range of technology every day, each individual being on the other hand is moving backward and losing formerly given (and trained) skills of co-existence in contentment. Once more in history – but this time in unseen dimensions – individual humans are no longer connected to their social surroundings as they used to be in the times before globalization. Disruptive developments make it more and more difficult to feel embedded in a community. This again, of course, makes people individually feel insecure. But there is even more reason for mental discomfort: The German philosopher Peter Sloterdijk reminded us of the contrast between the soul of a Bayreuth opera-goer at the end of the 19th century and that of a hiker in a forest around Berlin only one generation later. While the parent generation of these times had been frightened by Wagnerian dragons and dwarfs inside the dark and mysterious forests, their children already traveled there voluntarily by car, enjoying the fresh air of the woods as weekend-relaxation. This technologically induced revolution of changing world views is accelerating even today. And it’s changing not only individuals’ views, but also the sensitivities and behavior of communities acting in the world as a whole. Today those words from a publication of 1999 almost foreshadow the most recent developments that we’ve seen in Catalonia and Venice. Obviously, there seems to be a powerful human desire for a spiritual home to counterbalance the centrifugal forces of globalization, which are exhausting people everywhere. At this point it seems appropriate – as an intermediate summary – to put it like this: The findings and manifestations of a globalized digitalization and its division of labor have made individuals lose track of durable integration into a consistent social community. The permanent surplus supply of information does not provide agreed (and, by this, secured) guiding directions for all members of a community. Instead, everyone faces disruptive effects in all places, all of the time. In effect, the intensively fractured integration of every individual into a worldwide community due to technology is accompanied by social isolation. And this clearly contradicts inherent human needs. As a precaution, it might be useful at this point to take a look at the theory of human recognition in general. Thus, it seems reasonable and essential to insert a preliminary note on some established aspects of epistemology. Human brains can only work and function (in the sense of any interaction with the world outside our individual crania), if there is any perception of the world as the basic precondition of all intellectual understanding. In other words: Our five senses are the doors to our mind. By listening to our surroundings, by watching, touching, smelling and tasting, we attentively collect the information we then need to act on, and behave accordingly in the world. The quantity of visual and auditory information that a cave man had to deal with was comparatively clearly arranged and easy to manage, even if he was out hunting in the woods. Compared to his life conditions, a pedestrian, for example in 1920 New York, met far more complicated challenges to find his way home without being knocked down by a horse buggy or run over by a motor car, unexpectedly overtaking it from behind. But even this citizen of New York didn’t face as much rudimentary information as any human being in today’s world has to process in his mind almost ceaselessly. This is what I call the permanent surplus of information supply. To estimate the full consequences of this – for a start seemingly unimpressive – development, we have to bear one more simple fact in mind: Not even the most vigilant and attentive human being can foresee the future. All our activities are based not only on facts that we definitely know for sure. They are in addition, inescapably, based on sheer speculations about what will happen next. This, in turn, means: Every human being is inevitably condemned to challenge particular presuppositions as a basis for all further activities, without any chance of knowing whether they will turn out to be correct or not. Even if we are unaware of this fact in our everyday life: Our brains constantly select those fractional amounts of information out of the vast totality of information offered by our environment, which they judge to be relevant in a particular situation. And after this selection process, in a further step, the information left is assessed within the scope of every individual’s activity plan. Although the skeletal structure of this process has not changed since the days of the caveman, the amount of potentially relevant information has virtually exploded. For a long time engines have accelerated our lives and telecommunication has helped to melt away distances between all kinds of senders and recipients. But today’s Internet has essentially changed the hearing range and the visibility range in historically unprecedented dimensions. Not even the velocity of sound safeguards our assumptions based on a certain status of information against opposing “breaking news”, potentially arriving from anywhere in the world at any given moment. And since complex worldwide causalities can be thwarted by all manner of surprising, new constellations, the ability to control even simple, individual lines of action may at any time be interrupted. Thus, the individual and the collective consciousness (must) inevitably, and repeatedly, get disorientated by the abundance of (ultimately for the most part insignificant) available information. Nonetheless, even reasonable protection against this kind of disorienting abundance cannot be provided by trying to block selected information to prevent the potential recipients from losing track. Because this, in turn, would mean knowing (utterly impossible!) what the basis of that reasonableness for any selection or non-selection might be. To summarize: The human brain has, undoubtedly, entered a new age. Every human brain (at least every brain that currently has access to the Internet) can be the target of any new information, no matter where on earth it is. We can say that information has become ubiquitous. But the changes we see not only relate to the dimension of space. Since a letter no longer has to be shipped over oceans or transported on roads, the whole of mankind can potentially access all information practically simultaneously. Whether it is day or night doesn’t matter any longer. Therefore, we can say that this has become a world of isochronism. All information is – at least potentially – everywhere in the world, at the same time. In consequence, all information can restructure every reality at any place, at any time, worldwide. This fact not only destroys any belief in secure knowledge about the past. More than that, it is also a very painful lesson about all our assumptions, which we want to use as the basis of our future activities. They are all doubtful and questionable at any time. Within the framework of epistemology, the age of a globalized and digitalized human consciousness will, inevitably, be an age of everlasting uncertainty. It is crucial at this point to realize that this kind of perpetual uncertainty is not only the fate of all citizens of a state, but of its political leaders and its administrators as well. One of the former presidents of Germany, Roman Herzog, once wrote: “Obedience is the nucleus and breeding ground of the state.” But if the commander has lost his leading knowledge, what could be the remaining justification for obedience? If Roman Herzog had the right understanding of a state’s functioning, the ubiquitous isochronisms of a digitalized world would erode and hollow out the foundations of the state per se. This insight requires taking appropriate measures for the sustainable coexistence of people and peoples. As I said at the beginning: It is not a disadvantage for humans to live in a small state today . And this thesis can easily be justified and explained on the basis of the empirical and epistemological contexts mentioned above. Due to these increases in speed and the uncertainties deriving from this, big nations with extensive areas of land, millions of citizens, innumerable languages and disparate cultures run no chance in the future race of having the best living conditions on this planet. The mere reaction time they require for all those social and economic adjustments that are perpetually required is far too long to keep pace with the ever-changing framework. Indeed, many people still believe that improvements in administrative productivity and a computerized rationalization of the workflow could compensate the perpetual change of circumstances. Some even think that a standardization and concentration of procedures could counterbalance the ubiquitous quantum leaps that are taking place at any given moment. But these theories underestimate a core phenomenon of factor changes: Developments do not occur in a linear way but with unforeseeable multidimensional disruptive effects. And only human beings have the very creativity at their command that is needed to mend those disruptions, in a way that is accepted by their fellow citizens in the long run. There is only one way to match the creativity of a visionary counterpart, and that is the use of one’s own creativity. The typical effect of this intellectual concept is, of course, progress and improvement on all sides. Based on this, the path is set to design the smart state of the future . The only promising search technique and detection method inside an endless intellectual merry-go-round of worldwide ideas (while facing a shark pool of disruptions at the same time) is the permission of a totally open intellectual process by – at the same time – guaranteeing and safeguarding a reliable framework of procedural rules and inalienable rights. This raises the question: What kind of state will be fit to guarantee the stability that is needed? Unfortunately, western democracies (including their supranational unions) have shown more than once that they are structurally vulnerable at one particular point: Even the fundamental principles of their own constitutional groundwork can fall victim to a majority decision at any time. And, to be honest, in a system of representative democracy, the group of people who can form a deciding majority is not very big. Protective arrangements in their legal systems have also turned out to be inappropriate in preventing these very foundations from being shaken by any arbitrary political mood of the day. The only bastion against such attacks on positive law seems to be the firm ethos of a ruling class – and, in particular, of its individually acting members – not to do so. But that ethos can only be a reliable safeguard for the constitutional framework, when it is deep-rooted in the values that are actually practiced in a tangibly close community. As soon as a ruling administrator is not personally interwoven into the community he makes decisions for, he loses the human contact that is needed to stabilize his ethos. Administrators who decide and act anonymously, without personally knowing the people they administrate, will always be tempted to modify even the holy rules of a constitution, as long as this strategy promises to solve a particular burning issue. It is evident that political leaders in these confusing times are perpetually tempted to simplify ambiguous situations and to slow down developments by shutting out all these ubiquitous isochronisms that I’ve outlined above. But disconnecting a society from intellectual and technical developments beyond its homeland borders is not a promising strategy to preserve any given political situation in the long run. The world has seen that neither the ancient Chinese emperors nor the almighty communist leaders of contemporary history managed to freeze human development by building walls. In times of digitalization all political attempts to stall progress by forcefully putting up digital walls will, of course, have some short-term successes. But their intentions to master the elemental forces of human creativity are already doomed to fail in the medium-term, because the proscribing politicians will lose their control for two simple reasons at least: First, they will not be able to control the disruptive and multi-dimensional developments all around since they cannot foresee the unknown future. And second, the violation of the people’s constitutionally guaranteed freedom of movement intensifies the citizens’ discomfort with their typical situation of uncertainty. Cutting people off from reality is not a popular move for politicians. If it is not only the factual world outside that creates uncertainty, but also the political decisions (instead of establishing a reliable framework of procedural rules and inviolable rights) then a community and its organizations come to an end. Preserving and developing a state in such times of ubiquitous isochronisms and – following on from that – permanent systematic disruptions, therefore brings the challenge of walking the fine line between intellectual openness on the one side and institutional constancy on the other (side). This all but paradoxical task can actually only be mastered by a very precise definition of the core tasks of a state’s institutions and its functions, that cannot (under any circumstances) be questioned. This leads – as a kind of revelation – to another surprising and exciting finding: The smaller a state and its authority are, the more insignificant and ineffectual are the points where uncontrollable and thus ungovernable disruptive forces can act. Big states with sophisticated institutions and an excessive bureaucratic work force are condemned to fail as soon as they are no longer in a position to maintain the accepted foundations of their existence. Inflexibility and immovability have always been a death sentence for the great empires in human history. But under today’s conditions of nonstop high-speed innovations, even every seemingly normal-sized state with its usual institutions, that we assume we’re familiar with, can rapidly turn into a mortally wounded colossus. Consequently, it is necessary to precisely define this core area of a state’s institutions and its functions. Due to time constraints, I will leave out some traditional questions of state organization that can be discussed perfectly well anywhere else. Instead, I want to concentrate on the essential question of today’s conference and on my subject in particular: How can a small state manage today’s specific challenges of ubiquitous isochronisms? The first of two answers to that question is part of the question itself: A small state is a state that is small. And this quality inherently predestines it to be the perfect tool, fit to endure all the coming storms of disruption. Big organizations are rigid, small ones are flexible. And flexibility is a feature that helps organizations to persist. A rowboat will already have avoided any difficult situation long before a tankship slowly changes its direction. But how could a small state with few natural resources and limited space manage to survive in a world full of bigger players? At this point we have to bear in mind that the primal source of our problem (called ‘ubiquitous isochronisms’) is to be found in the phenomenon of digitalization. We are dealing with a technique for recording and sending the content of human thinking and intelligence. Creativity is what matters. But brainwork does not require any significant amount of space. It was the scholastic philosophers who already knew that thinking can be done by millions of intellectual angels on the tip of a single needle. This comes from the fact that reality has two dimensions: The tangible world of objects and the virtual world of thoughts. Traditional philosophers named these two worlds ‘mundus intelligibilis’ and ‘mundus sensibilis.’ Thus, interactive communication via the Internet (beyond the pure algorithm work of machinery) only requires two human brains and a certain kind of hardware with some cabling or antenna, and an electric current somewhere out there in the real, tangible world. For that you do not have to operate a geographically large state with millions of public servants and impressive government facilities. From the perspective of intellectual exchanges on the Internet a state is already big enough inside the ‘mundus sensibilis’ as soon as it has sufficient space to deploy and maintain a network-compatible computer of any considerable size. And that state does – moreover – not even have to be big enough to shelter and accommodate the creative minds themselves. It is sufficient to welcome their brains inside the virtual ‘mundus intelligibilis’ of this state. The tangible bodies of the creative minds can be anywhere outside around the globe. Based on practical experience, there’s just one circumstance that is absolutely indispensable for any successful innovative engagement: Creativity will only flourish in places where human brains have the freedom and permission to assemble to work on their unlimited ideas. In this regard, small states on the one side and creative minds on the other are mutually attractive. While intellectuals discover new horizons of human thinking, the state that permits this increases its wealth and the happiness of its native and virtual citizens. As long as the ruling (and permitting) political power is not endangered by the uncontrollable disruptive effects of innovation, the sensitive balance of this fruitful arrangement can persist to mutual benefit. Moreover, one might expect that – as a side-effect –the assembled creative minds that enjoy the liberties of free thinking would be the best guarantee of ensuring that this kind of state prevails. And that again justifies the assumption that small states should wisely call for free thinkers. I think there is some reason to believe that the dominant political direction of development in the last century that was slanted towards big states and impressive administrative multi-state unions is coming to an end. More and more people understand that their personal strategies to master the challenges of human life are incompatible with the strategies of other people on the globe. And maybe the time has come to admit that the relevant discrepancies are too big to be resolved by the sheer attempts of harmonizing politics within one region and one state. Especially an intervening state that tries to be in line with everyone inside a multicultural society must inevitably now and again create self-contradictions. Wherever it isn’t possible to resolve these disagreements by trade and cooperation, it seems the best advice is to segregate and partition incompatible groups and to offer them the chance of peaceful separation. Two scientists from Munich have just published an article on the subject of the political economy of secession that I found very impressive. Their research has not only shown an increase of nations worldwide from 57 to 194 within the last 100 years. They also point out that the dogma of unchangeable borders on the one hand indeed safeguards a given status quo. However, this dogma can collide painfully with the right of self-determination on the other hand. Isn’t therefore a better way toward a peaceful political framework to allow secession, as the chief economist of the magazine ‘Wirtschaftswoche,’ Malte Fischer, recently suggested? Ten years ago, the Ethiopian economist Eleni Gabre-Madhin formulated the secret of human happiness in a wonderful sentence. She said: “Happiness is freedom of choice”. If that is true (and I personally believe it is) we could transfer this economic insight into the world of states and citizenships. We would then come to the conclusion that the more states the planet has the more happiness could be provided for civilians. Although the surface of the earth is limited, human brains and their creativity is not. So in the end I believe that the smartest strategy to prevail in an ever-changing world of uncertainties is to learn how to learn. If you cannot control your circumstances then you have to control your skills, to be able to adapt to the changes. And at the center of all intellectual efforts it can never be wrong to study the philosophy of science. Together with training and schooling of the traditional canons of education, a community can be made fit for the future. Intelligence can survive on the tip of a needle. Ja, ich bin Mitglied der FDP. Ja, ich kandidiere bei der Wahl 2017 für den Deutschen Bundestag. Ja, ich werde selbst auch die FDP wählen. Und nein, ich werde vielleicht nicht in den Bundestag gewählt. Denn in meinem Wahlkreis gibt es auch heute noch immer mehr Sozialdemokraten als Liberale und mein Platz auf der Landesliste sieht von hinten besser aus als von vorne. Endlose Debatten habe ich in meinem Leben mit Menschen geführt, die sagten, man solle am besten überhaupt nicht wählen. In der Tat kann man diesen Standpunkt vertreten. Es ist aber nicht meiner. Denn würde niemand – wirklich niemand – außer allen derzeitigen Bundestagsabgeordneten wählen, dann bliebe das Parlament auch nach der Wahl faktisch unverändert. Mindestens dann, wenn alle sich selbst wählen. Und weil sich unser Bundestag auch durch noch so intensives Beten aller Nichtwähler in ihren stillen, einsamen Stuben nicht aus dem Zugriff seiner Bundestagsvizepräsidentin und ihrer Kolleginnen befreien wird, bleibt nur der Gang zum Wahllokal, der Griff zum Stift und das Malen von Kreuzen, um vielleicht, vielleicht, vielleicht irgendetwas – irgendetwas – zu bewegen. Betritt man aber den Kreis der Wähler und sucht man nach dem richtigen Platz für das eigene Kreuz, dann bleiben – jenseits lustiger Protestsymbolik durch Ausmalen des Wahlzettels, Schwärzen aller Kandidaten oder Unterstützung obskurer Miniparteien – unter realistischen Annahmen überhaupt nur diejenigen Wahlentscheidungen potentiell ergebnisrelevant, die eine erwartbar auch von anderen hinlänglich unterstützte Partei betreffen. Kurz: Einfluss auf das Gesamtwahlergebnis kann nur derjenige nehmen, der eine Partei wählt, die mit überwiegender Wahrscheinlichkeit die gesetzlichen Hürden für einen Einzug in das Parlament überwindet. Damit werden die Auswahlmöglichkeiten selten. Es gibt nämlich nur eine einzige Partei in ganz Deutschland (wahrscheinlich sogar auf der ganzen Welt), die aus meiner Sicht auf allen Politikfeldern die wirklich zutreffenden Ansichten vertritt. Es ist exklusiv diese eine Partei, die alle gesellschaftlichen Fragen richtig beantwortet, deren Personal ich einschränkungslos unterstütze und deren politische Gesamtperformance ich seit vielen Jahren immer wieder mit der Note „exzellent herausragend“ bewerte. Es ist dies die – zugegebenermaßen sehr kleine – Partei, deren einziges Mitglied ich selbst wäre und die ich noch immer nicht offiziell gegründet habe. Was ich sagen will, ist: Jede Entscheidung für eine Partei ist immer ein Kompromiß. Denn in jeder Partei trifft man auf andere Menschen mit anderen Auffassungen und anderen Präferenzen. Politische Parteiarbeit und Parteiauswahl sind nichts anderes eine Suche nach der irgend größtmöglichen Übereinstimmung. Wählen heißt demnach nie, das Beste zu erküren, sondern – im Gegenteil – immer nur, das Schlechteste auszusortieren. Demokratische Wähler heben also nicht das Großartigste hervor, sondern sie versuchen, das Unsinnigste zu verhindern. Und in unseren derzeitigen Millionengesellschaften mit ihren anonymen Wählermassen ist diese Einflußnahme zusätzlich auf das Homöopathischste verdünnt. Die einzige Möglichkeit, die eigene politische Tropfenschwere in diesem Ozean auch nur irgend minimal zu erhöhen, besteht darin, nicht lediglich aktiver Wähler zu sein, sondern sich auch passiv der Wählbarkeit zu stellen. Doch dazu später. Zunächst will ich die Frage erörtern: Wohin führt die Überlegung einer demokratischen Negativauslese am Wahltag? Von den Parteien, die überwiegend wahrscheinlich wieder in den Bundestag einziehen werden, muß ich mir als Rheinländer über die CSU keinerlei Gedanken machen. Horst Seehofer kostet mich also überhaupt keine Überlegungszeit. Wählbar im Rheinland ist aber die CDU. Ich kenne eine ganze Reihe von Menschen, die der CDU nahestehen. Ich kenne Menschen, die Mitglied dieser Partei sind. Ich kenne sogar Mandatsträger der CDU. Doch die vernünftigen und verantwortungsbewussten Menschen in dieser Partei sind dort derzeit in einer augenscheinlich ganz aussichtslosen Minderheit. Die bloße Tatsache, dass es dieser Partei in der jüngsten Vergangenheit trotz exzessiven Versagens ihrer Vorsitzenden auf ungezählten Politikfeldern nicht gelungen ist, sich von ihr zu trennen, belegt aktuell die schlichte Unwählbarkeit dieses Vereines. Wo parteipolitischer Zusammenhalt und Gruppenloyalität mehr wiegen als eine Kultur der Fehlerkorrektur, da liegen die Dinge im Argen. Statt alle ihre vielfach zusammengefassten Fehlleistungen hier noch einmal aufzuzählen: Alleine der mangelnde Rechtsbefolgungsgehorsam ihrer Vorsitzenden schließt aus, diese CDU zu wählen. Gleiches gilt für die SPD. Der Kadavergehorsam, mit dem ihre Vertreter den inzwischen schon nur noch wahnhaften Eurorettungsprojekten folgen, ihre ins Gigantische ragende wirtschaftspolitische Verantwortungslosigkeit, die ungehemmte Bereitschaft, sich migrationspolitisch in Wunschträume zu flüchten, statt Realitäten zur Kenntnis zu nehmen und das nicht nur klimapolitisch beobachtbare Abrücken vom rationalen, wissenschaftlichen Weltbild unseres Kontinents, all dies fügt sich in das Bild einer kritikunfähigen 100-Prozent-Martin-Schulz-Unterstützertruppe, die nach der bekannten Devise handelt: Je mehr wir uns verliefen, desto schneller gingen wir. Was für CDU und SPD gilt, ist für Linke und Grüne natürlich nur umso zutreffender. Es reicht nicht, kein Personal zu haben, um ein fehlendes Programm durchsetzen zu können, man muß auch unfähig sein, die eigenen intellektuellen Verirrungen ohne die erzwungene Unterstützung anderer zu ertragen. Wenn es heute in Deutschland irgendwo noch Armut, Benachteiligung oder soziales Elend gibt, dann sicher nicht infolge zu geringer Umverteilung oder unzureichender Solidarität. Gesellschaftliche Probleme in Deutschland haben heute nur noch eine einzige Ursache und die heißt: Zu viel Politik. Wer Menschen die Last nimmt, ihre eigenen Entscheidungen verantworten und bisweilen über sich selbst nachdenken zu müssen, der schafft genau jene fremdalimentierten Sozialbiotope, in denen kultursensible Kochkurse auf Steuerzahlerkosten und das akademisch verordnete Binnen-I gedeihen. Kaum ein Kenner der Berliner Szene würde doch heute noch seine Hand dafür ins Feuer legen, dass eine von der Linken mitgewählte Kanzlerin Merkel nicht auch fähig wäre, den Wiederaufbau des Palastes der Republik zur Gewissensentscheidung umzustilisieren. Wer glaubt, in sozialpädagogischen Metadatenanalysen die Realität erkennen zu können, der muß auch davon überzeugt sein, mit einem Verbot von Verbrennungsmotoren zwischen Nettetal und Görlitz den Lebensraum der Eisbären am Südpol zu retten. Kurz: Alleine die Gefahr einer Pinguinepidemie in Nordschweden nötigt, alles Wählermögliche zu tun, um eine drohend grüngestützte Merkelverlängerung zu vermeiden. Dies führt – in der weiteren Negativauslese – nun folgerichtig zu der vorletzten Frage nach der Wahl einer gänzlichen Alternative für das deutsche Land. Kann der verbliebene Gründergeist von Joachim Starbatty reichen, um hier Gedeihliches erwarten zu dürfen? In den vergangenen Wochen bin ich mehrfach aus dem Schlaf hochgeschreckt. Immer wieder hatte ich diesen Traum. Ich saß auf einer einsamen Insel unter einer Palme, aß eine Kokosnuss und wartete auf Hilfe. Nur Wilson sah mir zu. Plötzlich näherten sich zwei Boote. In einem erkannte ich Claudia Roth, im anderen Alice Weidel. Aus den Wolken riefen mir Margot Käsmann, Reinhard Marx und Campino zu: „Claudia weiß, wo es langgeht!“. Ich wußte es natürlich nicht. Ich weiß allerdings auch nicht, in welche Richtung Alice Weidel und Co. ihre Alternativpartei in nächster Zeit werden steuern können, wer sich dort durchsetzen wird und wer nicht. Ich weiß umgekehrt sicher, dass keine der anderen Parteien des künftigen Bundestages auch nur ansatzweise bereit sein wird, mit dieser Partei – und entwickelte sie sich noch so erfreulich – zu kooperieren. Damit aber stiege nur wieder das Risiko, dass irgendeine machtpolitisch konstruierte Vielparteienkoalition Politik für den Einzug multikultureller Regenbogenpinguine in ein klimaneutral EU-finanziertes Staatsratsmuseum zu weiteren Steuerzahlerlasten betriebe. Und weil ich exakt das nicht will, bleibe ich seit Wochen des nachts immer wieder auf meiner Trauminsel sitzen, steige in kein Boot und warte auf einen jungen blonden Hoffnungsträger, der nicht länger zusieht, sondern mich mit einem gelb-blau-magentafarbenen Hubschrauber an neue Ufer rettet. Natürlich ist die FDP nicht die beste Partei der Welt. Natürlich macht sie nicht alles richtig. Natürlich gibt es viel an ihr zu kritisieren. Und natürlich sehe auch ich in ihren Reihen Personal, das perspektivisch durch noch bessere Kräfte ersetzt werden kann. Doch eine nicht ganz unwesentliche Vielzahl von Menschen ist in dieser Partei wenigstens schon einmal unter der Überschrift versammelt, einen unkomplizierten Staat gestalten zu wollen. Eine nicht ganz unwesentliche Zahl von Menschen strebt dort nach einer Politik, die rechnen kann, nach Selbstbestimmtheit, nach Respekt vor der Leistung anderer und nach Freiheit als Menschenrecht für alle, weltweit. Bei aller Kritik an vielerlei scheinen mir dies Ziele zu sein, für die es sich gemeinsam zu arbeiten lohnt. Mir ist auch klar, dass das aktuelle Wahlprogramm der FDP aus liberaler Sicht Anlass zu Kritik gibt. Wie könnte es auch anders sein? Es ist ein Werk aus vielen Händen, erdacht von vielen Köpfen und in einem gemeinsamen Prozess ausformuliert. Jeder, der daran mitgewirkt hat, muss also Passagen finden, die ihm gefallen und Passagen, die ihm nicht gefallen. Aber genau das ist ja auch die nötige Konsequenz der beschriebenen Negativauslese. Parteien sind kein Ponyhof, Politik ist kein Zuckerschlecken und Parteipolitik in Millionengesellschaften ist also erst recht kein Ponyschlecken. Doch jeder, der den methodologischen Individualismus der österreichischen Schule verinnerlicht hat, weiß: Es gibt nicht „die“ FDP. Es gibt nur eine Vielzahl einzelner Menschen, die – ein jeder für sich – eigene Ideen davon, wie Politik gestaltet sein sollte, in einen gemeinsamen Prozess einbringen. Hält man die, die diesen Prozess zu einem bestimmten Zeitpunkt federführend gestalten, für ungeeignet oder ihr Tun für verbesserungswürdig, dann muss man sich ihnen anschließen und das ganze mit viel Geduld besser machen. Wer die meisten anderen überzeugt, der setzt sich durch. Das dauert, ist aber nicht unmöglich. Schlecht ist nur, sich ganz abzusetzen. Denn wer weggeht, der gibt alle Chancen auf Einflußnahme auf. Ich habe – zum Vergleich – im Wesentlichen während meiner eigenen Lebenszeit beobachten können, wohin es führt, wenn alle klügeren und vernünftigeren Menschen entnervt ihre Kirche verlassen, weil dort mehr und mehr Geistlosigkeit Platz greift. Plötzlich stellt man fest, dass an der Spitze ihrer Institutionen Menschen handeln, die ebenso bewußt wie offenbar ernst gemeint das eigene Kreuz und sogar die Grammatik ablegen und unsere Erde als „Planetin“ bezeichnen. Es ist aber eine Fehlannahme, zu glauben, in einem chaotischen Kindergarten kehre alleine dadurch wieder Respekt und Friedlichkeit unter den Kleinen ein, wenn die Erzieher kopfschüttelnd nach Hause gehen. So funktioniert das nicht. Nur wenn die, die ihr Studium zuende gebracht, die einen Beruf gelernt und ausgeübt, ihre Kostenbeiträge an die allgemeinen Kassen erbracht und Eigenverantwortung erlebt haben, nur wenn die auch auf politischer Ebene mitreden, statt dies den im Leben Unerprobten, Unerfahrenen und Gescheiterten zu überlassen, deren freizeitaffin-zeitreiche Lebensleistung im wesentlichen aus dem Nichtlesen von Referentenentwürfen besteht, nur dann kann auch ein Staat halbwegs ordentlich funktionieren. Die Inhalte und das Personal der FDP geben mir genau hier und heute noch immer mehr Hoffnung als die aller anderen Parteien, denke ich. Und wer weiß es? Am Ende wählen mich am 24. September 2017 doch noch alle zur Vernunft gekommenen örtlichen Sozialdemokraten und zusätzlich alle Nordrhein-Westfalen, die diese Zeilen hier lesen, die FDP. Dann komme ich am Ende tatsächlich in den Bundestag. Und am Ende, das weiß ja jeder, wird immer alles gut. Warum können wir uns vorstellen, daß Woody Allen in einer New Yorker U-Bahn von Rockern verprügelt wird? Und warum ist John Wayne genau das nie passiert? Selbstbewußtsein und Selbstbehauptung eines Menschen stehen miteinander in einer engen Verbindung. Nur wer an sich selber glaubt, hat überhaupt erst eine Aussicht auf die Möglichkeit, daß auch andere an ihn glauben. Dieser spezifische Zusammenhang besteht nicht nur bei einzelnen Personen, sondern auch bei Gruppen von Menschen. Gegen den FC Bayern oder den CF Barcelona können allenfalls solche Fußballmannschaften gewinnen, die ohne Angststarre in das Spiel gehen. Nur wer selbst daran glaubt, besser sein zu können als der andere, der kann auch gewinnen – notfalls in der Verlängerung. Entscheidend ist, welches Bild die Betreffenden von sich selber haben. Denn genau dieses Bild lebt man und zeigt man der Welt. Gesetzt, diese grundsätzlichen Überlegungen sind richtig: Warum sollte für Europa insgesamt etwas anderes gelten? Vielleicht muß dieses Europa (was immer es überhaupt sei) weniger Angst vor „Überfremdung“ haben, wenn es sich vorab einmal für sich selbst interessiert – und also dafür, was es in der Welt sein will. In diesem Falle könnte jeder einzelne Europäer am Ende auch dafür zu gewinnen sein, nicht nur negativ gegen eine Islamisierung, sondern im Gegenteil konstruktiv und positiv für eine Europäisierung des Abendlandes einzustehen. a.) Eine erste terminologische Vorüberlegung: Was ist Selbst-be-wußt-sein? Von einem „Selbstbewußtsein“ zu sprechen bedeutet, vier gedankliche Aspekte zu erfassen: (1) Das „Sein“ – als Substantiv – deutet auf eine bestehende Existenz. Etwas ist. (2) Mit dem Wortbestandteil vom Wissen („…wußt…“) wird ein denkendes Subjekt angesprochen: Irgendjemand weiß etwas. (3) Das Morphem „…be…“ kündet von der Passivität dessen, von dem etwas gewußt wird: Ebenso, wie einer besonnt wird oder beschallt, wie er berühmt ist oder begnadet, besessen, beseelt oder belächelt; er steht im Lichte eines fremden Wissens. (4) Schließlich sagt das „Selbst“ in „Selbstbewußtsein“, daß irgendjemand etwas von dieser Existenz eines anderen weiß; und dieser andere ist eben rückbezüglich das eigene Selbst. Anders gesagt: Wenn ich mir meiner selbst bewußt sein will, dann geht das nur, wenn ich für einen Augenblick aus mir heraustrete und mich selbst betrachte. Dann weiß ich von mir. Von mir selbst. Eine völlig andere Qualität von „Selbstbewußtsein“ ist angesprochen, wenn ich nicht von einem einzelnen Individuum spreche, sondern von einer Mehrzahl von Menschen. Denn ein Kollektiv von Menschen verfügt nicht über ein „Selbst“ wie ein konkreter einzelner Mensch. Eine menschliche Gesellschaft kann keinen Kopf- oder Magenschmerz haben, weil sie weder über einen Kopf noch über einen Magen verfügt. Eine Menschenmenge ist kein konkretes Subjekt! In den Worten von Margaret Thatcher: “There is no such thing as society.” Das heißt: In der objektiven, äußeren Welt gibt es keine Gesellschaften. Es gibt nur einzelne Menschen. Gesellschaften entstehen nicht in der realen, objektiven Außenwelt, sondern im Auge und Kopf des Betrachters. Gesellschaften sind immer nur subjektive gedankliche Abstraktionen desjenigen, der über sie spricht. Verschiedene Betrachter können daher beim Betrachten ein und derselben Ansammlung von Männern gleichzeitig völlig andere Gesellschaften sehen: Einen Männerclub, einen Raucherclub oder eine Skatrunde. Den Mitgliedern einer solchen Gesellschaft geht es dabei nicht anders. Jeder konkrete einzelne macht sich unter Umständen völlig unterschiedliche Vorstellungen darüber, welcher Gruppe er angehört, weil jeder einzelne die Gemeinschaft, in der er sich befindet, subjektiv anders deutet. Um sich ihrer selbst als Gemeinschaft zu vergewissern, tauschen die Angehörigen einer Gesellschaft sich über ihr jeweiliges Selbstverständnis als Gruppe aus. Die Individuen definieren, was jeder zusammen mit den anderen darstellen möchte. Der eigene Beitrag zum Ganzen und die Erwartungshaltung anderen gegenüber werden ausgesprochen. Bürgerliche Gesellschaften z.B. definieren dazu in einem Gesellschaftsvertrag ihren gemeinsam verfolgten Gesellschaftszweck und sie bestimmen, welches Individuum welchen konkreten Beitrag zum Ganzen zu leisten hat. Das erscheint in übersehbaren Gruppen noch vergleichsweise simpel. Schwieriger gestaltet sich die Lage, wenn die Mitgliedschaft einer Gesellschaft so viele Köpfe umfasst, daß sie einander nie auch nur persönlich treffen können. In solchen Gesellschaften, etwa zur Konstituierung eines Staates aus einer Menschenmasse, ersetzen Erzählungen über das gemeinsame Herkommen, über den gemeinschaftlich bewohnten Landstrich oder über Staatsziele die verbindende Zweckbestimmung und Selbstdefinition aller. Dieses (heute gerne so bezeichnete) „Narrativ“ konstituiert dann ein gewisses gemeinsames Selbst und also die Bedingung der Möglichkeit von gesellschaftlichem Selbstbewußtsein. Gibt es aber ein solches gemeinsames europäisches Narrativ, ähnlich der Nibelungensage oder dem Rütlischwur, das allen Europäern die Chance zu einer kollektiven Selbstfindung, zu einer überindividuellen Identifikation spenden kann? Kann es ein verbindendes Moment geben, das für (nahezu) alle Menschen, die sich körperlich in Europa aufhalten, Gemeinschaft stiftend verbindlich ist? Oder wird der französische Napoleon immer ein anderer sein als der englische, deutsche oder polnische Napoleon? a.) Was überhaupt ist auf Dauer Europa, was europäisch? Wie hat man Europa (und das Europäische) überhaupt zutreffend zu definieren? Augenscheinlich weiß das niemand so genau. Geographisch? Historisch? Ökonomisch? Weltanschaulich? Religiös? Rechtlich? Wertorientiert? Politisch gar, mit der EU? Alles das scheint gut vertretbar, das jeweilige Gegenteil allerdings auch. b.) Welche kulturellen Narrative dominieren aktuell? Jenseits der definierenden Grenzziehungen schwirren die buntesten Narrative über unseren Kontinent. Der Ökologismus, in allen Spielarten von Bodenschutz bis Klimaschutz. Ein allgegenwärtiger Konsumismus. Nihilismus und Pessimismus. Demokratismus. Bürokratismus. Multikulturalismus. Antirassismus. Emanzipatismus. Wohlfahrtsstaatlicher Umverteilungs-Infantilismus. Bequemer Komfortismus etc. pp. Die Europäische Union (als eine von vielen Möglichkeiten, „Europa“ zu verstehen) sagt von sich selbst, sie sei ein Raum der Sicherheit, der Freiheit und des Rechts. Mißt man diese Ideale an den Realitäten, könnten Zweifel aufkommen. Unkontrolliert-ungebändigte Masseneinwanderung schafft keine Sicherheit. Die Freiheit in einer das Internet zensierenden und das Bargeld abschaffenden Gesellschaft erscheint, milde gesagt, limitiert. Das Recht erfährt abnehmende Beachtung, wenn das Primat der Politik vordringlich blanken Funktionalismen folgt. Was also bleibt? Lange Jahrzehnte waren Europa und die Europäische Union Hoffnung spendende Synonyme für den Frieden. Herrscht aber (noch) Friede zwischen Mitgliedstaaten, wenn sie einander mit Kommissaren überwachen, sich unter Kuratel stellen, einander Bedingungen stellen und in Kategorien wechselseitiger Schuldzuweisungen agieren? Und: Selbst wenn man konstatiert, daß alle Mitgliedstaaten der Union nicht in offen gewaltsame Konflikte miteinander verstrickt sind: Herrscht Friede der Europäischen Union und ihrer Mitgliedstaaten gegenüber dem Außen? Oder sind nicht vielmehr schon offene Konflikte Teil des europäischen Alltagshandelns geworden, in Afghanistan, in Mali, in Syrien, um einige zu nennen? d.) Ist innerer Friede ein Exportgut? Selbst wenn man annähme, in der Europäischen Union herrsche interner Friede und selbst wenn man weiter annähme, die Europäische Union und ihre Mitgliedstaaten stünden nicht in unfriedlichen Konflikten mit Dritten außerhalb, dann bliebe zu fragen: Läßt sich innere Friedlichkeit exportieren in eine unfriedliche Welt? In eine Welt, die mindestens außerhalb Europas unübersehbar miteinander in unfriedlichen Verhältnissen steht? Welches wären die Voraussetzungen, um einen solchen Friedlichkeitsexport mit Aussicht auf Erfolg durchzuführen? Wenn es kein allgemeinverbindliches, weil allgemein für richtig und zutreffend gehaltenes Narrativ für alle Europäer gibt, dann mangelt es wohl an genau demjenigen Selbstbewußtsein, dessen es bedürfte, um anderen außerhalb Europas Kunde von der Überzeugungskraft der auf diesem Landstrich für richtig gehaltenen, gemeinsamen Selbstbetrachtung zu geben. Und wer nicht einmal an sich selbst glaubt, der kann – wie eingangs schon festgestellt – andere denknotwendig nicht dafür begeistern, diesen Glauben zu teilen. Aktuell finden sich auf Deutschlands Straßen Demonstranten unter Plakaten zusammen, auf denen es heißt „Liebe Ausländer, lasst uns mit diesen Deutschen nicht allein!“ oder „Deutschland, Du mieses Stück Scheiße“. Anders gesagt: Die Begeisterung eines Außenstehenden für eine solche Gesellschaft, die der unseren gleicht, ist in diesem Kontext wohl eher unmöglich. In der gegenwärtigen „Flüchtlingskrise“ (die ungeachtet ihrer Bezeichnung neben eigentlichen Flüchtlingen im klassischen Sinne offenbar auch vielerlei Migranten unterschiedlichster Subkategorien zum hoffnungsvollen Aufbrechen in ein anderes Leben motiviert) droht nicht nur der Friedensexport zu scheitern, sondern im Gegenteil sogar ein Konfliktimport verwirklicht zu werden. Die Staaten auf dem Territorium Europas sehen sich derzeit nach Monaten der unbeschränkten Einreisemöglichkeiten für jedermann vor einem Zwei-Fronten-Konflikt mit variierenden Kulturen: Nicht nur an den Außengrenzen der Länder droht Ungemach, sondern insbesondere auch im Inneren der europäischen Staaten. Den (in den Augen von Sicherheitsexperten) schier endlos einströmenden Mengen und Massen junger waffenfähiger Männer von überall stehen die (in den Augen der Sozialpolitiker) begrenzen Humankapitale Europas mit ihren eingefallenen demographischen Pyramiden gegenüber. Fast will scheinen, als verwirklichten sich vor unseren Augen die düsteren Prognosen über den „Youth Bulge“, also die Warnung vor demographisch gegenläufig konturierten Gesellschaften, deren junge Männer sich im Verteilungskampf um Lebensaussichten benachteiligt sehen und ihr Aktivitäts- und Aggressionspotential zum Ressourcenerwerb nun gegen die aus ihrer Sicht teilungsunwilligen Besitzenden zum Einsatz bringen. Gesetzt den Fall, wir müßten annehmen, daß Europa in der Tat nicht positiv definiert werden kann, sondern – worauf zurückzukommen sein wird – nur negativ, dann wäre vielleicht mindestens übergangsweise zielführend, die Fahndung nach dem gesuchten Narrativ einer Eigendefinition vorläufig in einer Negativabgrenzung nach außen zu verorten. Anders gesagt: Findet sich Europa vielleicht dadurch, daß es erst einmal klarstellend verneinend sagt, was es jedenfalls nicht ist, statt gleich bejahend zu sagen, was es ist? Ein geschichtlicher Exkurs mag Licht in die mögliche Fruchtbarkeit dieser Arbeitshypothese bringen. 5.) Geschichtlicher Inkurs: Wo steht Europa? Ein Blick auf die Landkarte rund um das Mittelmeer und eine Vergegenwärtigung der historischen Entwicklungen ebendort läßt tatsächlich etwas erkennen, was manche Tagespolitik aus dem Blick verloren zu haben scheint. Der uns eben noch – bis zum Jahr 1990 – so übermächtig präsente Ost-West-Gegensatz der großen politischen Blöcke stellt sich im größeren Kontext der Betrachtung geradezu nur als eine kurze Episode der geographisch näheren Konfliktgeschichte dar. Anders gesagt: Die tatsächlich existentiellen Kampflinien verlaufen seit mindestens anderthalbtausend Jahren völlig anders. Betrachtet man in möglichster Kürze die Entwicklung der Machtverhältnisse rund um das Mittelmeer, gewinnt man recht bald gewichtige andere Perspektiven. Im Jahr 570 wurde der Prophet Mohammed in Mekka geboren. Bis zu seinem Tod in Medina anno 632 änderte er die Machtverhältnisse auf der arabischen Halbinsel. In der Folge blieb rund um das Mittelmeer nichts, wie es gewesen war. Im Jahr 610 hatte er sich als der Prophet Allahs erkannt, 613 seine Mission begonnen und sich 620 mit Mitstreitern daran gemacht, die arabische Halbinsel zu erobern. Als er starb, war dieses Werk bereits gelungen. Seine Nachfolger [die in Gestalt entzweiter Sunniten und Schiiten zugleich bis heute vielgestaltig heftig um das wahre Erbe des Propheten und seiner wohl einzigen leiblichen Tochter ringen] eroberten bis 638 dann die Gebiete des heutigen Irak, Syriens und Palästinas, bis 642 Ägypten, 651 weitgehend den Iran, 654 Rhodos, sie teilten 688 Zypern und zogen bis 698 westwärts quer durch Nordafrika. Im Jahr 700 war der Mittelmeerraum faktisch dreigeteilt in eine weströmische, eine oströmische und eine islamisch beherrschte Einflußsphäre. Der anschließende Eroberungsfeldzug des Islam gen Norden erfolgte auf breiter Front; im Osten, im Westen und in der Zentralregion des Mittelmeers: 717/718 belagerten arabische Kämpfer im Osten – noch – erfolglos Konstantinopel, das heutige Istanbul und mithin die seinerzeitige Hauptstadt des Byzantinischen Reiches. 719 eroberten sie hingegen im Westen ungebremst erfolgreich fast das gesamte heutige Spanien nebst Portugal, zogen 720 nordwärts bis Narbonne und konnten (nach vorherrschend geltender Geschichtsschreibung) erst 732 in der Schlacht bei Tours von dem Franken Karl Martell zurückgeschlagen werden. Das heutige Frankreich blieb demgemäß christlich. 878 jedoch wurde im Süden Syrakus und mit dem Fall von Taormina 902 schließlich ganz Sizilien arabisch bzw. islamisch. Eine Gegenbewegung hierzu setzte erst im Jahre 961 wieder ein, als die Byzantiner zunächst Kreta und 965 dann Zypern für das christliche römische Reich zurückeroberten. Bis zur vollständigen Rückeroberung der iberischen Halbinsel durch den christlichen Norden vergingen indes noch mehr als 500 Jahre: Die sogenannte Reconquista erlangte in Spanien erst im Jahre 1492 wieder die Macht für das Christentum. Wer Granada besucht, erhält diesen Kampf durch die Betrachtung einerseits der Alhambra und andererseits des nebenstehenden Palastes von Kaiser Karl bis heute eindrücklich vor Augen geführt. Anders als Rom, das inmitten Italiens noch sicher vor arabischen Angriffen gelegen war, standen Konstantinopel und mithin das gesamte Byzantinische Reich spätestens seit 717 stets unmittelbar an der Grenze dem expansionsgeneigten Islam gegenüber. Nicht ohne Grund wird Byzanz heute als ein wesentlicher – wenn nicht der wesentliche – Faktor dafür angesehen, daß der Mittelmeerraum bis heute (noch) nicht insgesamt islamisch geworden ist. Byzanz war im Kern eine Melange aus römischer Verwaltung, griechischer Kultur und christlichem Glauben. Diese Elemente verliehen dem Byzantinischen Reich eine beachtliche Bestandsdauer von 393 bis 1453. Nicht ohne Grund wird diese Zeitspanne herangezogen, um das gesamte Mittelalter zeitlich zu definieren. Zur Erinnerung ein Rückblick: Die sogenannte Reichsteilung Roms in eine weströmische und eine oströmische Hälfte erfolgte im Jahre 395, weniger um das Ganze zu zerteilen, sondern mehr, um schlankere und handlungsfähigere Strukturen zur Erhaltung des schwächelnden Gesamtreiches herbeizuführen. Während die ewige Stadt Rom die Hauptstadt des weströmischen Teiles blieb, stieg Konstantinopel zur Hauptstadt des oströmischen Reiches auf. Das vormalige exilgriechische Byzantion (oder lateinisch: Byzantium) war zu Ehren des Kaisers Konstantin des Großen (270 – 337) umbenannt worden. Denn mit seiner „konstantinischen Wende“ hatte er das Christentum zur führenden Religion in Rom gemacht. Indem Christen seitdem die „Staatsreligion“ stellten, sahen sie sich übrigens vor dem Problem, eine Theorie zum legitimen Gebrauch von Waffen im Krieg zu entwickeln. Dies besorgte der im Jahre 430 gestorbene „Kirchenvater“ Augustinus mit seinem Konstrukt vom „gerechten Krieg“: Nach dieser Darstellung gilt derjenige Krieg als gerechtfertigt und gerecht, der einen Frieden herbeiführt. Der im Jahre 395 abgetrennte Westteil des römischen Reiches war dennoch schließlich im Jahre 476 nicht mehr gegen die germanischen, gotischen und alemannischen Angriffe aus dem Norden zu halten. An die Stelle des letzten autochthonen Kaisers Romulus Augustulus trat der eingewandert assimilierte Germane („Flavius“) Odoaker, der sich jedoch sogleich dem oströmischen Kaiser unterstellte. Unter der Führung Konstantinopels erlebte das Römische Reich daraufhin noch einmal eine erhebliche Blüte. Verlorene weströmische Provinzen wurden zurückerobert, zwischen 528 und 534 kodifizierte Kaiser Justinian (527 – 565) den Corpus Iuris Civilis – eine Rechtsquelle, die bis heute in Europa juristisch erheblich nachwirkt! – und 537 ließ er den Rohbau der Hagia Sophia fertigstellen. 572 indes begann für Byzanz der Krieg im Osten gegen die Perser. Bis 650 schrumpfte das Byzantinische Reich infolge seiner zusätzlichen Konflikte im Nordwesten mit Slawen und Bulgaren und mit den arabischen Eroberern im Süden erheblich. Die dadurch erzwungene Reduzierung ihres Territoriums nutzen die Byzantiner gleichwohl zur internen Neuorganisation. Genau diese half ihnen dann im Schicksalsjahr 717/718, dem von Süden geführten Angriff der Araber auf ihre Hauptstadt – wie schon ausgeführt – erfolgreich zu trotzen. Entscheidender für die zumindest vorläufig nachhaltige Befriedung ihrer Grenzen zur arabischen Einflußsphäre hin war jedoch noch die Schlacht bei Akroinon 740, die den Byzantinern dann auf längere Zeit Sicherheit vor der islamischen Expansion brachte. Erst mehr als dreihundert Jahre und viele territoriale Erweiterungen später, im Jahre 1071, erfuhr Byzanz erstmals wieder eine empfindliche militärische Schwächung seiner Position. Bei der Schlacht von Manzikert im Osten des Byzantinischen Reiches siegten die Seldschuken, mithin dasjenige Volk, das weitere zweihundert Jahre später, 1299, als Osmanisches Reich auf die Bühne der Weltmächte treten sollte. Wesentlich an dieser Niederlage war nicht nur, daß sich die Seldschuken (alias Osmanen, alias Türken) an der byzantinischen Ostgrenze der Verbreitung des Islam verpflichtet sahen. Noch folgenreicher war, daß diese verlorene Schlacht praktisch unmittelbar in den Ersten Kreuzzug 1095 bis 1099 mündete. Papst Urban II. ließ sich nämlich von Byzantinern überzeugen, daß das Römische Reich insgesamt durch die islamischen Seldschuken und ihren Sieg gegen Byzanz gefährdet sei, weswegen er die christlichen Pilger Europas aufrief, sich zu bewaffnen und mit diesem Ersten Kreuzzug Byzanz zu Hilfe zu kommen. Urban II. war bei dieser Gelegenheit zugleich erfreut, daß er und nicht sein Gegenpapst Clemens III. (1084 bis 1100) von den Byzantinern um Hilfe ersucht wurde. Dies stärkte seine eigene Stellung als der wahre Papst. Ziel dieses Kreuzzuges sollte sein, Palästina zu erobern, was mit der Eroberung Jerusalems auch gelang. Der „gerechte Krieg“, den Augustinus 600 Jahre zuvor theologisch beschrieben hatte, wurde nun von den Kreuzrittern zur sogenannten Heidenabwehr instrumentalisiert. Infolge des Ersten Kreuzzuges wurden rund um Jerusalem vier Kreuzfahrerstaaten gegründet. Das Königreich Jerusalem umfasste ungefähr das heutige Israel, das Fürstentum Antiochia den Nordlibanon, die Grafschaft Edessa das heutige Syrien und die Grafschaft Tripolis den Süd-Libanon. Um diese Staaten in ihrer Frontlage gegenüber den arabischen Mächten zu stützen, wurde 1147 bis 1149 der Zweite Kreuzzug durchgeführt, der allerdings ohne irgendeinen greifbaren Erfolg blieb. Im Gegenteil. 1187 eroberte der islamische Führer Saladin seinerseits dann sogar Jerusalem. Ein Grund für die Schwäche des Zweiten Kreuzzuges im Osten mag gewesen sein, daß Papst Eugen III. schon 1146 vorsorglich allen potentiellen Kämpfern in Spanien gestattet hatte, nicht nach Palästina zu gehen, sondern im Westen die iberische Halbinsel gegen die dort ebenfalls expandierenden islamischen Mauren aus Nordafrika (Berber) zu halten. Die Eroberung Jerusalems durch Saladin 1187 rief dann den Dritten Kreuzzug von 1189 bis 1192 hervor, der sozusagen mit einem Unentschieden endete. Auch dieses Patt allerdings sollte wieder nicht von Dauer sein. Papst Innozenz III. rief 1198 zum Vierten Kreuzzug auf, der im Oktober 1202 begann. Der Plan dieser Kreuzritter, Jerusalem durch eine vorher strategische Einnahme Ägyptens zurückzugewinnen, scheiterte jedoch. Die Byzantiner verweigerten den Kreuzrittern bei Konstantinopel den benötigten Proviant. Namentlich die hoch verschuldeten Kämpfer aus Venedig, die Konstantinopel sowieso als Konkurrenten in der Ägäis und als Hemmschuh für den eigenen Handel im Schwarzmeerraum betrachtet hatten, fürchteten darum, die verheißenen Gewinne in Palästina nicht realisieren zu können. Sie wendeten sich daher gegen Konstantinopel selbst, um es auszurauben. Die Stadt wurde verwüstet. Auch die Spaltung der katholischen und der orthodoxen Kirche, die im Jahre 1054 mit dem Schisma – der gegenseitigen Verfluchung per Bannbullen – begonnen hatte und bis zum Jahr 1965 dauerte, war damit endgültig vollendet. Das Byzantinische Reich zerfiel nach diesem Angriff Venedigs zunächst in drei Nachfolgestaaten. Deren stärkster, das Kaiserreich Nikaia, eroberte 1261 Konstantinopel noch einmal zurück. Gleichwohl vertraute man in Konstantinopel jetzt nicht mehr den vormals Verbündeten im Westen. Gegen die weiteren Angriffe der Araber und Osmanen blieb Byzanz daher nun alleine. Im Jahre 1291 eroberten islamische Mamluken Akkon und zerstörten in der Folge alle Burgen und Städte der Kreuzfahrerstaaten, um deren Rückkehr in den Orient endgültig unmöglich zu machen. Die Südausdehnung des christlichen Abendlandes war damit gestoppt. Die Schlacht auf dem (heute kosovarischen) Amselfeld von 1389 brachte im Norden nur noch einmal vorübergehende Entlastung auch für Byzanz gegen die Osmanen. Am 29. Mai 1453 fiel Konstantinopel endgültig in die Hände des Osmanen Mehmed II. Die sogenannte „Türkengefahr“ von 1453 verband sich – nebenbei bemerkt – im Jahre 1455 im Basel und Straßburg bei den dortigen Eliten zu einem frühen ersten deutschen Nationalismus eigener Art; dort nämlich las man den wiederentdeckten Text „Germania“ des römischen Schriftstellers Tacitus aus dem Jahre 95, der in dieser Sichtweise des 15. Jahrhunderts den Deutschen eine Sonderstellung im Christentum zuordnete. Umbenannt in Istanbul wurde die Stadt nunmehr das Zentrum des schnell wachsenden Osmanischen Reiches (1299 bis 1922). In der Literatur wird die Auffassung vertreten, der Islam habe sich bis zu den Kreuzzügen im wesentlichen deswegen nicht für Nordeuropa interessiert, weil man sich selbst kulturell dem Norden überlegen fühlte. Der Kampf mit den Christen habe dann aber zu diversen Einigungen unter zuvor zerstrittenen muslimischen Fraktionen geführt. Der Zusammenbruch des Osmanischen Reiches 1922 und die Gründung der Türkei 1923 sind übrigens nicht nur wesentliche Mitursachen für die auf jeder Landkarte sichtbaren ‚unnatürlich geometrischen‘ Grenzziehungen zwischen Syrien, Iran und Irak, die wir heute kennen. Man geht sicher auch nicht fehl in der Einschätzung, daß die Funktionen Konstantinopels als eines breiten Grenzstreifens zwischen arabisch-islamischem Süden und christlich-europäischem Norden jedenfalls nach 1923 von der modernen Türkei unter Kemal Atatürk mit seinem konsequent laizistischen Staatsverständnis und seiner Westbindung in die NATO übernommen wurden. Der Osmane Süleyman I. (1522 – 1566) war es jedenfalls, der dieses islamische Reich zu den Höhepunkten seines herrschaftlichen Einflusses führte. 1521 eroberte er Belgrad, 1522 wieder Rhodos und 1529 belagerte er Wien. Den zweiten Eroberungsversuch dieser Art unternahmen die Osmanen 1683 mit Prägekraft bis heute im Jahre. Kurz: 717/718 in Konstantinopel, 732 bei Tours, 1187 in Jerusalem, 1389 im Kosovo, 1453 wieder in Istanbul, 1529 und 1689 in Wien – von den Rückeroberungen, Kreuzzügen, einem späteren Napoleon in Ägypten oder internen westlichen Schlachten in Tobruk 1941 und El-Alamein 1942 ganz zu schweigen; immer wieder läuft seit 632 eine konsequente Konfliktlinie zwischen dem Christentum im Norden und dem Islam im Süden. Die Verlockung, andernorts das eigene Glück zu finden, und die Möglichkeiten der Kooperation mit lokalen Machthabern andernorts schuf und schafft offenbar weit über Rohöl, Gewürze, Geschmeide und Bagdad-Bahn hinaus wohl immer wieder die historisch einschneidendsten Verwerfungen rund um das Mittelmeer. Europa scheint sich nach allem trotzdem (noch immer) nicht positiv selbst definieren zu können. Jahrhundertelang hat nur eine negative Abgrenzung nach Süden hin – mehr schlecht als recht; mal mehr, mal weniger – stattgefunden. An die Stelle von Byzanz dürfte jedenfalls während des späten 20. Jahrhunderts wesentlich das weltweit etablierte fiat-money-System mit seinem erdölgestützten realwirtschaftlichen Bezug getreten sein. Die Industriestaaten haben das Öl aus denjenigen islamischen Ländern gekauft, die es aus ihren Böden gerade fördern konnten. Bezahlt wurde in US-amerikanischem Papiergeld, dessen Wert seit dem 15. August 1971 indes kontinuierlich verfällt. Der wenig nachhaltige Scheinreichtum der erdölfördernden Länder und ihrer nationalen Eliten ließ die historischen Nordausflüge des islamischen Einflußgebietes vorübergehend in Vergessenheit geraten. Nun aber verfällt dieses Bollwerk des Westens gegen den Süden zusehends. Europa wird durch seine wenig funktionsfähige Europäische Union wirtschaftlich und politisch geschwächt. Gleichzeitig kommt die Kultur, gegen die sich Europa abgegrenzt hatte, nun in Gestalt ungezählter Migranten schier gegenständlich zu uns. Was tun? Kann sich Europa ohne ein positives eigenes Selbstbewußtsein überhaupt als Europa gegen die Ankommenden und ihre bisweilen sehr selbstbewußt verankerte Kultur behaupten? Zweifel sind angebracht. 7.) Sind Wertexport und Akzeptanzwerbung Bollwerke für den Frieden in Europa? a.) Ein (geistig-kulturelles) Vakuum kann nicht expandieren; es reißt niemanden mit. Stattdessen implodiert Europa eher in der Erinnerung an seine vergehende Größe. Der Schlachtruf, nach dem der Islam zu Deutschland gehöre oder ein Teil von Deutschland sei, ist nach allem offenkundig ahistorisch und faktenblind. Schon seine Formulierung, der zufolge es nur einen einzigen Islam gebe, kündet von einer wenig intellektuellen Durchdringung der beifallheischenden Floskel. b.) Namentlich Deutschland als territoriale Zentrale Europas ist ebenso deutlich wie nachhaltig geschwächt. Der geographische und ökonomische Kern Europas ist somit nicht das stärkste, sondern im Gegenteil sogar das an Selbstbewußtsein schwächste Glied der europäischen Familie. Seine monetäre Stärke ist mit dem Wegfall der DM gebrochen; seine persistierende historische Schuld breitet sich inzwischen sogar auch schon auf seine Anrainer aus; das Verbot von Autokennzeichen in Österreich, die Assoziationen an ruhmlose deutsche Geschichte erwecken könnten, spricht für sich. Das negative Identitäts- und Motivationsnarrativ der Deutschen namens NS-Vergangenheit schwächt heute alle Europäer. Anders als noch viele US-Bürger, die an das pull-marketing von der größten Nation glauben, sind jedenfalls Deutsche und zunehmend Europäer von dem push-marketing eines „Hinweg von der Geschichte“ rein negativ motiviert; ihr Narrativ ist nicht die Verlockung, sondern das Erschrecken. Ein solches Vakuum expandiert nicht nur nicht, es saugt in seinem Implodieren sogar Energien ab. c.) Europa ist aktuell im Rückmarsch gegen den Islam wie wohl nie zuvor in der Geschichte. Die christlichen Kirchen sind in ihrer Politisierung und parteipolitischen Instrumentalisierung als relevante, gesellschaftlich einende Kraft faktisch zerfallen. Der Euro schwächt die Wirtschaft. Es fehlt die Begeisterungsfähigkeit nach innen und nach außen. Der mehr und mehr aufkeimende interne Streit unter den dysfunktional zwangsvereinten EU-Mitgliedern wirkt heute wohl beinahe so destruktiv und kontraproduktiv wie weiland der Angriff Venedigs auf Byzanz. Bezeichnend ist der Satz: ‚Die internationale Gemeinschaft ist zwar international, doch selten Gemeinschaft‘, gesagt von Michael Wolffsohn im „Handelsblatt“ am 31.01.2016. 1.) Wir Europäer müssen Europa neu erfinden, als Bürger, als Menschen, als dezentral und selbständig denkende Individuen. Wir müssen definieren, wer wir sein mögen. Wir müssen den Mut haben, uns unseres eigenen europäischen Verstandes zu bedienen. Wir müssen die Kraft (wieder-) gewinnen, uns zu unseren eigenen Werten zu bekennen und sie zu leben, ohne uns dabei auf anmaßende staatliche und überstaatliche Institutionen zu verlassen. 2.) EU-Bürokratie kann nicht leisten, heterogenen Gesellschaften eine identitätsstiftende Kultur zu empfehlen oder gar zu verordnen. Beamte haben nie etwas erfunden, konstruktive Kreativität gehört – bei aller Raffinesse eines Staatsapparates bei der abgabentechnischen Abschöpfung fremder Arbeitsfrüchte – nicht zu den Chancen politischer Verwaltung. 3.) Es bedarf einer europäischen Öffentlichkeit, die nicht zentral und interessegeleitet gesteuert ist. Sie (aus Gründen der eigenen Machtabsicherung) nicht gefördert zu haben, ist eine elementare Sünde des politischen Establishments in Europa. Diese europäische Öffentlichkeit darf auf Dauer nicht der bequemen Versuchung erliegen, ihre Stärke daraus zu gewinnen, Deutschland unter persistierendem Hinweis auf den unehrenhaften Teil seiner Geschichte zu schwächen. Die europäische Öffentlichkeit darf sich auch nicht selbst moralisch dadurch zu erhöhen versuchen, fremde Schuld als eigene anzunehmen und diese nun realpolitisch abtragen zu wollen. Wer blind ist für die Geschichte, der kann die Zukunft nicht gewinnen; doch wer die Schockstarren der Vergangenheit nicht überwindet, der kann sich auch nicht zum Wohle aller neu orientieren. Vergeben kann man sich nicht selbst, sondern nur anderen. Europa insgesamt hat nach allem auch ein ganz eigenes Interesse, Deutschland und seiner Geschichte gegenüber Nachsicht walten und den Blick in die Zukunft wagen zu lassen. 4.) Wenige europaweit bekannte EU-Politiker und EU-Verwalter und/oder einige etablierte „Staatsschauspieler“ ersetzen keine gemeinsame Bühne für eine Gesamtidentifikation. Vor uns liegt die Aufgabe, positive Beispiele für europäische Persönlichkeiten zu finden, die das zu formulierende europäische Narrativ lebendig erzählen können. 5.) Unsere gewachsene mediterrane Kultur – vielleicht sogar nach dem byzantinischen Dreiklangmuster aus christlichem Glauben, griechischer Kultur und römischer Verwaltung – kann sich auf Dauer nur behaupten, wenn sie sich selbst und selbstbewußt definiert. Zu den elementarsten Grundbausteinen eines solchen erfolgreichen Europa gehören die Herrschaft des verläßlichen Rechts, der Abschied vom unverläßlichen Primat der Politik und die Definition eines erkennbaren gegenständlich-territorialen Raumes, innerhalb dessen all das stattfindet. Denn das hilft – im beiderseitigen Befriedungsinteresse – zuletzt sogar allen Nachbarn, die dann wissen, worauf sie sich einstellen können. Der Ausgangspunkt aller nachfolgenden Überlegungen ist wesentlich dieser: Eine jede (natürliche oder juristische) Person, die in der Lage ist, nicht nur für sich selbst, sondern auch für andere Menschen Regeln setzen zu können, steht unausweichlich in der Versuchung, ihre Regelungsmacht – gewollt oder ungewollt, bewußt oder unbewußt, in guter oder schlechter Absicht – zu überdehnen. Wird aber die Macht, einen bestimmten Gegenstand regeln zu können, über das Maß des Vernünftigen hinaus genutzt (um nicht zu sagen: mißbraucht), dann drohen allen Beteiligten daraus nachteilige Konsequenzen: Die Regelunterworfenen werden der schlechten Regel nicht freiwillig folgen; die zu regelnde Lage verschlechtert sich gegenüber dem Zustand, in dem sie sich befand, bevor sie geregelt wurde, noch weiter; der Regelgeber verliert sein Ansehen, verbindlich Regeln setzen zu dürfen; zuletzt stehen alle Beteiligten vor der Aufgabe, nicht nur die (ihnen allen vielleicht unterdessen vollständig entglittene) regelungsbedürftige Materie neu ordnen zu müssen, sondern auch vor der weitaus umfassenderen Notwendigkeit, die Person des künftigen Regelsetzers neu zu bestimmen. Unter der Annahme, daß alles menschliche Leben in gesellschaftlichen Kontexten gewisser Regeln bedarf, um die gegenseitigen Erwartungen aneinander befriedend zu stabilisieren, erscheint die Untersuchung der Frage sinnvoll, über welche Regelungsinhalte ein Regelgeber überhaupt tatsächlich sinnvoll (d.h. auf lange Sicht wirksam) verfügen kann. Die Erörterung dieser Thematik samt aller ihrer Vorfragen setzt allerdings zunächst eine Verständigung über die verwendeten Begriffe voraus, um sicherzustellen, daß die erarbeiteten Kerngedanken auch allerorts in den zutreffenden Kontext gestellt sind…. Recht und Gesetz sagen uns, wie wir uns richtigerweise zu verhalten haben. Juristische Normen legen damit Standards fest, an denen sich unser Handeln orientieren soll. Handeln in diesem Sinne ist nicht nur aktives Tun. Auch ein bloßes Nichtstun kann ein Handeln im juristischen Sinne darstellen. Strafrechtliche Lehrbücher erklären diesen Zusammenhang oft mit dem Beispiel einer Mutter. Bei ihr macht es offenkundig keinen Unterschied, ob sie ihren neugeborenen Säugling aktiv tötet oder ob sie ihn, selbst völlig passiv bleibend, verhungern lässt. In beiden Fällen hat sie gleichermaßen rechtsrelevant gehandelt und sich wegen einer Tötung strafbar gemacht. Für Ärzte am Sterbebett eines Patienten ergeben sich aus dieser Gleichstellung von Tun und Unterlassen oft schwierigste Verhaltensprobleme. Denn die zentrale Frage, mit der Ärzte dort konfrontiert werden, lautet: Welches medizinische Handeln ist geboten, um abwendbare Lebensgefahren abzuwehren, ohne zugleich einen aussichtslosen Kampf gegen Unabwendbares zu führen, der tatsächlich nur das Leiden des Sterbenden vermeidbar verlängert? Diese Frage zu stellen, heißt praktisch einzuräumen, dass es wirklich richtige Antworten hier kaum geben kann. Denn im Angesicht des Todes stehen Arzt und Patient nur allzu oft in einem Raum der Unsicherheiten, der keinerlei feste Orientierung bietet. Je weniger sicheres Wissen Menschen aber über eine bestimmte Situation haben (und haben können), desto spekulativer muss ihr Verhalten werden. Wo wir nicht an Gewissheiten anknüpfen können, da sind wir für unsere weiteren Entscheidungen und unser weiteres Handeln auf bloße Annahmen und Vermutungen zurückgeworfen. An die Stelle des klaren Wissens treten das Meinen und das Abschätzen. Ob eine bestimmte Gefahr für Leib und Leben des Patienten prognostisch noch anzuwenden sein wird oder ob es gegen sie keine wirksamen medizinischen Mittel mehr gibt, bleibt im Unklaren. Trifft der Arzt in dieser Lage die Entscheidung, einen objektiv aussichtslosen Kampf zu führen, verlängert er das Leiden seines Patienten. Gibt er den Kampf indes zu früh auf, stirbt unter Umständen ein Mensch, der noch hätte gerettet werden können. Technische Fortschritte der Medizin haben das Arsenal potentiell möglicher Maßnahmen gegen den bevorstehenden Tod eines Menschen inzwischen gleichsam unabsehbar erweitert. Man wird kaum fehlgehen mit der Feststellung, dass heute ein jeder Tod eines jeden Menschen mit bereits existierenden medizinischen Mitteln mindestens noch verzögert werden kann. Dies wirft zwangsläufig die Frage auf, wer über eine solche Herauszögerung des Todes und insbesondere über den hierfür erforderlichen Mitteleinsatz zu befinden hat. Belässt man die Befugnis zur Entscheidung über diese Frage im Zuständigkeitsbereich des Arztes, dann vergrößert man zwangsläufig den Bereich derjenigen Verhaltensunsicherheiten, in denen er sich ohnehin bereits befindet. Denn die technische Grenzverschiebung der Rettungsmöglichkeiten, die weit in den Raum der Unsicherheit über die tatsächliche Lage hineinreicht, erweitert die ärztlichen Handlungs- und mithin Entscheidungsspielräume unausweichlich. Was der Arzt richtigerweise zu tun und was er zu unterlassen hat, verunklart sich erheblich. Im Gegenzug lassen sich diese Handlungsnöte eines Arztes am Sterbebett allerdings deutlich reduzieren, wenn Recht und Gesetz in dieser Lage genau demjenigen eine größere Mitsprachebefugnis über die anstehenden Abläufe zugestehen, den es unmittelbar selbst angeht: Den sterbenden Patienten. Wer, wenn nicht er, soll am ehesten legitim über Situationen entscheiden, in denen niemand, auch kein Arzt, verlässliche Tatsachenfeststellungen und Zukunftsprognosen liefern könnte? Wenn richtig ist, dass es der Patient ist, der über jedwede medizinische Maßnahmen oder Nichtmaßnahmen bis an die Grenze von Impfzwang und Quarantänepflicht in freier Willensbestimmung zu entscheiden hat, dann muss auch richtig sein, ihn im Angesicht seines eigenen Todes relevant über einsetzende oder ausbleibende Rettungsmaßnahmen bestimmen zu lassen. Indem der deutsche Gesetzgeber im Jahre 2009 mit der Einführung von § 1901a BGB die Möglichkeit schuf, eine sogenannte „Patientenverfügung“ zu errichten, erweiterte er somit nicht nur die rechtlich verbindlichen Entscheidungsbefugnisse für einen jeden Patienten. Die Möglichkeit, als Patient im Vorhinein bestimmte ärztliche Heileingriffe rechtswirksam zu untersagen, führte für jeden Arzt auch zu der Reduzierung seiner eigenen Handlungsnöte am Sterbebett. Weite Teile des Prognoserisikos, wie sich eine bestimmte gesundheitliche Krisensituation künftig mutmaßlich entwickeln werde, sind nunmehr, eine sorgsame Patientenverfügung vorausgesetzt, von dem Arzt auf den Patienten verlagert. Hat der Patient verfügt, gewisse Rettungsmaßnahmen künftig definitiv nicht zu wünschen, ist der Arzt von der Last befreit, für den Patienten entscheiden zu müssen. Heilung und Rettung zu versuchen, wo er es als Arzt vielleicht noch für hoffnungsvoll hielte, kann ihm nun definitiv verboten sein, wo und wenn der Patient es so gewollt und niedergeschrieben hat. Kritiker haben gegen derartige Patientenverfügungen zwar eingewandt, künftige Patienten seien sich zum Zeitpunkt der Abfassung einer solchen Verfügung oft gar nicht der Bedeutung und Tragweite ihrer medizinischen Festlegungen bewusst. Diese Bedenken greifen aber, genau betrachtet, im Ergebnis nicht durch. 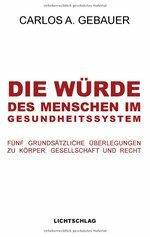 Denn von der Anstrengung, über die eigene Gesundheit nachzudenken und sich möglichen Fragen einer künftigen Behandlung zu stellen, kann und sollte ein verantwortungsbewusster Mensch nicht entbunden werden. Im Gegenteil: Je existenzieller die Probleme sind, mit denen im Rahmen einer Therapie umgegangen werden muss, desto größer ist das Bedürfnis, über sie von dem betroffenen Patienten selbst entscheiden zu lassen, statt die wirklich schwergewichtigen Antworten dann von Angehörigen oder gar Fremden erwarten zu wollen. Jeder, der seinen Körper und seine Gesundheit ernst nimmt, hat also Anlass, durch sorgsame Gespräche mit den Ärzten und, nötigenfalls, Juristen seines Vertrauens gewissenhafte Formulierungen zu finden. Immerhin kann er im Falle des Falles durch solche Klarstellungen auch ganz maßgeblich die Gewissen seiner Nächsten entlasten. Während die zivilrechtlichen (und in der Folge auch die strafrechtlichen) Verhältnisse zwischen Arzt und sterbendem Patienten daher nun mit jener Gesetzesregelung in § 1901a BGB einer ebenso sinnvollen wie rechtsethisch anerkennenswerten Präzisierung zugeführt wurden, belastet eine andere Schwierigkeit wiederum genau diese medizinische Behandlungsbeziehung. Denn das Hinauszögern eines Todes bzw. der Versuch, die Verlängerung eines Menschenlebens zu erreichen, werden durch die sozialversicherungsrechtlichen Gesetze in Deutschland einer anderen, rechtsethisch äußerst problembehafteten Perspektive unterworfen. Kann der Patient selbst entscheiden? Ob ein medizinischer Eingriff durchgeführt wird oder welche von mehreren alternativ in Betracht kommenden ärztlichen Maßnahmen verwirklicht werden, bestimmt nach gefestigter zivil- und strafrechtlicher Rechtslage in Deutschland in erster Linie der Patient selbst. Solange er wachen Geistes ist, hat er von seinem Arzt aufgeklärt und gefragt zu werden, was sein Wille als Patient ist. Auch die objektiv unvernünftige Entscheidung des Patienten, einen bestimmten ärztlich angeratenen Eingriff nicht durchführen zu lassen, muss akzeptiert werden. Kein Erwachsener darf gegen seinen Willen einer Operation unterzogen werden. Anders ist die Rechtslage jedoch für jeden „Pflichtversicherten“ in der gesetzlichen Krankenversicherung nach Maßgabe des Fünften Sozialgesetzbuches (SGB V). Nach diesen sozialversicherungsrechtlichen Regeln sind der Wille des Patienten und seine freie Willensbestimmung hinsichtlich der Durchführung oder Nichtdurchführung bestimmter medizinischer Maßnahmen praktisch unbeachtlich. Ist das „Pflichtversicherungsverhältnis“, also der gesetzliche Zwang, an der öffentlichen Krankenversorgung teilzunehmen, einmal begründet, so bestimmen sich alle Inhalte der medizinischen Behandlung nach dessen internen Regularien. Gefragt wird dort nicht, was der Patient wünscht oder welche Behandlungsmaßnahme er und sein Arzt einer anderen vorziehen. Maßgebend ist allein, dass die ausgewählte und durchgeführte Behandlung ausreichend, zweckmäßig, wirtschaftlich und notwendig ist, wie § 12 Abs. 1 SGB V bestimmt. Was im Einzelnen diesen Kriterien genügt, definiert der sogenannte „Gemeinsame Bundesausschuss“, der aus Vertretern von Kassenärztlichen Bundesvereinigungen, Deutscher Krankenhausgesellschaft und Spitzenvertretern der Krankenkassen gebildet wird. Er beschließt nach § 92 Abs. 1 SGB V die zur Sicherung der ärztlichen Versorgung erforderlichen Richtlinien über die Gewährung der ausreichenden, zweckmäßigen und wirtschaftlichen medizinischen Versorgung der Versicherten. Indem der Staat mit dem gesetzlichen Versicherungszwang für seine Bürger unausweichlich macht, sich diesen medizinischen Richtlinien zu unterwerfen, fördert er nicht nur deren Gesundheitsversorgung auf der einen, sondern begrenzt er auch den Umfang ihrer potentiell lebenserhaltenden Behandlungschancen auf der anderen Seite. Da das eine nicht ohne das andere zu erreichen ist, bleibt die rechtsethische Frage, ob ein Staat seine Bürger zur Teilnahme an einem bzw. zur Unterwerfung unter einen derartigen Sachzwang wirksam verpflichten kann. Gute Gründe sprechen dafür, dies zu verneinen. Denn wenn ein Staat seine Bürger anerkanntermaßen schon nicht gegen deren Willen zu objektiv sinnvollen medizinischen Eingriffen zwingen kann, warum sollte er dann legitim befugt sein, sie in Zweifelfällen zwingen zu dürfen, bestimmte lebensrettende Maßnahmen nicht ergreifen zu können? Solange diese Frage nicht allgemein akzeptabel beantwortet ist, müssen wir uns eingestehen, dass unser Staat durch verbindliche sozialversicherungsrechtliche Gesetze beim Sterben hilft. Jeden Tag. Überall im Land. Für die überragende Mehrzahl aller Bürger, die in einer gesetzlichen Krankenkasse „pflichtversichert“ sind. Dieser Artikel ist zuerst in der Novo-Printausgabe (#119 – I/2015) erschienen.